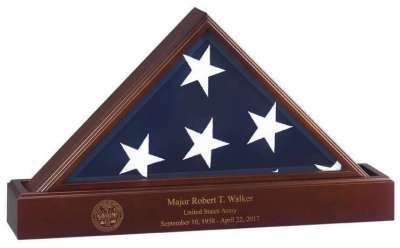 Our Admiral Flag Case with Laser Engraved Pedestal is a beautiful way to personalize service to our country. Hand-made in North Carolina using 100% sourced American materials. Solid Hardwood Construction front and back. 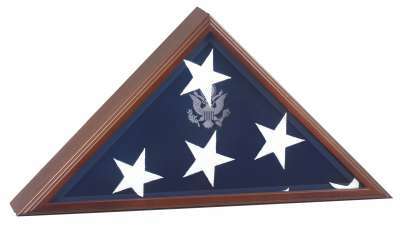 The combination Laser Engraved Pedestal Urn can be used as a stately base or stand for the display of your flag case or it can be used as an urn. The hidden urn has 225 cubic inch capacity and is accessed by a removable bottom panel. The Admiral Flag Case with Laser Engraved Pedestal includes your choice of FREE laser engraving and/or FREE laser medallion. Made in America. FREE and FAST shipping. FREE laser engraving. 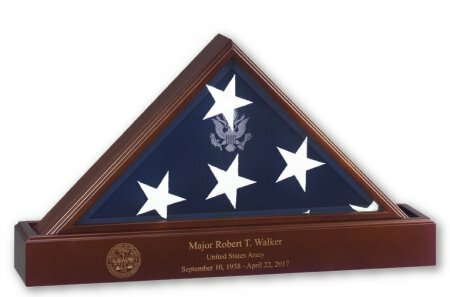 Create your own custom personal flag display case set. 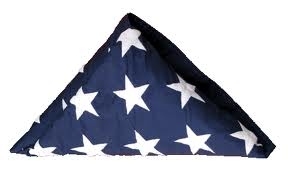 Your Admiral Flag Case with Laser Engraved Pedestal will be built in the mountains of North Carolina by skilled wood craftsmen who take deep pride in their work for our veterans and heroes. We select beautiful hardwoods, cut and sand each piece to exact dimensions then we carefully join each piece with the best furniture making techniques. A 24 step finishing process ensures that your Admiral Flag Case with Laser Engraved Pedestal is an heirloom for generations.